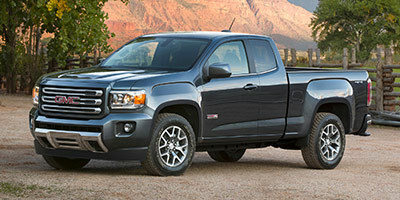 The GMC Canyon is a midsize truck sold as a premium option. With sporting smart looks, lots of style and plenty of capability, the Canyon was introduced a few years ago and has done well since. For 2018, there aren't many changes to the GMC Canyon, but some of them might be significant to buyers. 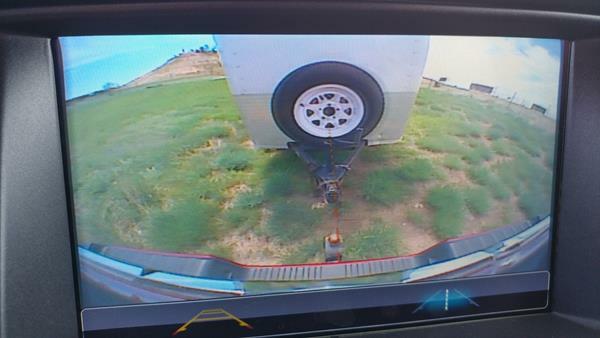 Notably, the biggest upgrade is to the trailering system, which adds ball hitch guidelines to the rearview camera system. Also of note is the larger 7-inch base infotainment screen. The Canyon is still offered with either a four- or six-cylinder gasoline or with a four-cylinder diesel engine in rear-wheel or four-wheel drive. The 2018 Canyon is a well-designed pickup truck that offers plenty of capability and usability alongside comfort and good looks. 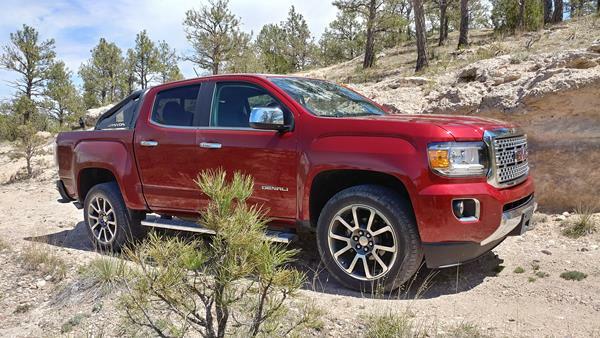 It has a few drawbacks, such as its larger size compared to rivals and its limited off-pavement capability, but the Canyon is an excellent choice in the midsize pickup category. The 2018 GMC Canyon is offered in two-seat or four-seat extended cab and five-seat crew cab body styles, with short or standard bed lengths for cargo. There are five trim levels, starting with the SL and base Canyon, running through the SLE, SLT and topping out with the Denali trim. The 2018 GMC Canyon is a great-looking pickup truck. It combines the square-on-square designs of Chevrolet and GMC trucks with a sportier cabin appearance. The big square grille is offset by headlamps that mimic that look, but adds rounded corners to the fenders and lamps, as well as the lower fascia, to tone down the toughness factor for a more sport-tuned look. The hoodline is flat and heavily carved for strength, but the raked windscreen and less pronounced fenders move away from the bulky look of full-size GM pickups for a more subdued, but not weak appearance. Along the beltline, the windows are pinched and rise up slightly at the rear to give a smaller greenhouse signature while the roofline has a tapered appearance to it that blends toward the Canyon's bed. The bed itself has high rails and strong rear fenders for more muscle, keeping the traditional large bumper and GM-exclusive integrated bumper steps found on most GMC and Chevrolet model trucks. The overall appearance of the 2018 Canyon is one of robust readiness with a hint of sport and speed. It's a great look for a midsize offering that steps away from the full-size muscle and big-rig appearance of bigger pickups without losing the strong capability factor associated with truck design today. The 2018 GMC Canyon has a well-done interior compared to other pickup trucks (large and small) on the market. The interfaces for basic controls are good and most general driving requirements can be done eyes-free. 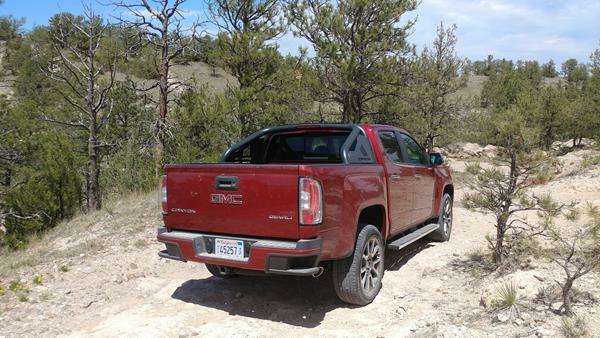 Our greatest knock against the Canyon is its pricey Denali trim, which is less luxurious than might be expected. We're also not fans of the rear doors, which are slim, even on the crew cab. This is otherwise an excellent pickup truck inside. Those not expecting to climb up and into a pickup will be disappointed with the GMC Canyon, which sits nearly as high as a full-size truck. Being larger than most midsize offerings, the Canyon is taller, but includes grab handles to make climbing in easier. Step bars are a must for shorter drivers and passengers, but not necessary (and likely an impediment) for taller folks. Seating is excellent in the Canyon, with plenty of room all around. In crew cab models, the rear seating is adult-friendly and comfortable on the outboards, and kid-usable at the center. The smaller king cab configuration is good for occasional backseat use, those with dogs, and for kids. It's otherwise cramped in the knees and difficult to get in and out of for adults. The cabin of the 2018 Canyon features a robust but thoughtfully designed dashboard and storage layout. We like the extra spaces for small devices and the large center bin. There are plenty of USB plus and other useful spots throughout the cabin as well. Even in the lower trims. 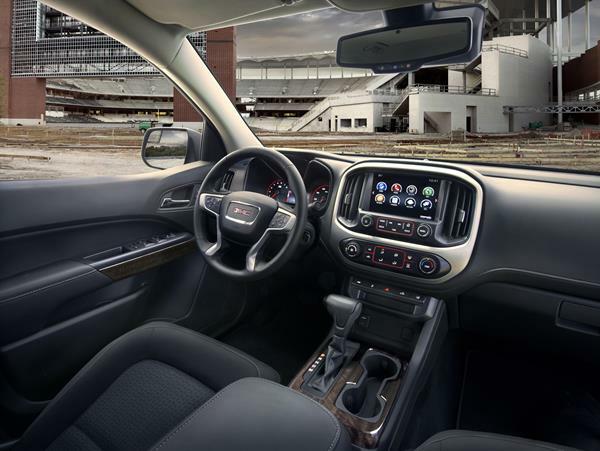 The overall impression of the 2018 GMC Canyon's interior is workaday readiness with some upscale appeal and hints at luxury. It's quiet on the highway, tough enough for daily work and generally well done in terms of ergonomics. We're fans of GM's IntelliLink system, though the one in the 2018 Canyon is not the latest generation. The 7-inch touchscreen that comes standard is nicely done and includes Bluetooth, Apple CarPlay and Android Auto as standard. The larger 8-inch screen is a nice upgrade, and adds navigation and better graphics. Menus are usually straightforward and easy to understand, with quick responses to button presses. Some of the tablet-like features of the screen are a bit quirky, with some not-as-intuitive requirements, such as side-swiping to switch between radio and maps in navigation mode and the lack of redundant buttons for faster jumps to specific menus, being a little annoying. The Bluetooth pairing system is quick and can be bypassed altogether thanks to the newest Android Auto upgrade, which is included. Apple CarPlay should do the same, but we haven't tried it. These systems also allow skipping the built-in navigation to use the phone's instead, which can improve graphics quality (via screen-casting) and map accuracy. Voice control in the 2018 Canyon is marginal. Most of the time, it will ask for repeats or get the wrong impression and go to the wrong sub-menu. For navigation in particular, using the phone's VR will be far better. The 2018 GMC Canyon boasts great fuel economy returns for its engine choices. The base four-cylinder gasoline engine is EPA-rated at 20 mpg in the city and 26 mpg on the highway, which is nearly best-in-class for that size engine. The six-cylinder gasoline engine is rated at 18 mpg in the city and 25 mpg on the highway, which is also very good for the class. The diesel engine is EPA-rated at 22 mpg in the city and 30 mpg on the highway. Better than any rival. Those numbers are for rear-wheel drive configurations. Most lose 1 to 2 mpg city and highway in four-wheel drive setup. The 2018 Canyon is expected to be About Average, according to the J.D. Power and Associates Vehicle Dependability Study. So far there have been no safety recalls on the Canyon this year, and the warranty GMC offers for the truck is about average for the segment. The 2018 GMC Canyon has done well in crash testing. The National Highway Traffic Safety Administration (NHTSA) gives the Cayon four stars overall (out of five), with four stars for frontal, five stars for side crash and three stars for rollover ratings. The Insurance Institute for Highway Safety rates the 2018 Canyon with top scores of "Good" on all crash tests performed. Advanced safety testing has not been published for the Canyon, but will likely also be good given last year's scores. The base engine in the 2018 Canyon is a 2.5-liter four-cylinder engine that outputs 200 horsepower and 191 pound-feet of torque. A six-speed manual transmission is standard with this engine and an automatic is available. Both rear-wheel and four-wheel drive are available as well. This four-cylinder engine is good for everyday driving, but feels sluggish on the highway and over hills. The upgrade engine is a 3.6-liter V6 that outputs more useful muscle at 308 horses and 275 lb-ft. This is a good engine for the Canyon, offering usable towing and better power for getting around at highway speeds. The diesel engine option is a 2.8-liter four-cylinder turbodiesel unit that outputs 181 hp and 369 lb-ft of torque. This engine is made for economy and towing, offering up to 7,700 pounds of pull for the Canyon. It's a well-done diesel that is worth the upgrade cost for many buyers. Turbo lag is a little lengthy in around-town driving, but on the highway or pulling a load, the diesel does a great job. 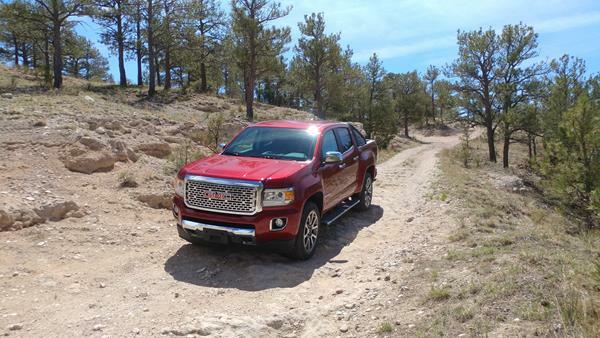 In terms of maneuverability and everyday feel, the 2018 GMC Canyon is a good truck. It's more maneuverable than a full-size truck, but only just so compared to the smaller midsize pickups it competes with. Visibility is very good and guessing where a bumper or tire is becomes easy for the driver, aiding parking and other tight movements. The new trailer lines are a nice touch for hitching up to a trailer and the GMC Canyon does a good job pulling that trailer around, with minimal sway and confident braking. Especially in the V6 and diesel models. The 2018 Canyon is generally more expensive than all of its midsize pickup truck rivals, but does make up for much of that with superior amenities and options. The base model is probably not going to sell well outside of fleets, but the resale value for four-wheel drive options is good, and the truck's usefulness means it has a wider audience than smaller options. We would steer clear of the Denali trim unless that's a must, as it's overpriced for the included accouterments. Lagging sales for late 2017 and most of 2018 have meant dealerships are willing to negotiate and add incentives for buyers. Low demand and a likely upgrade for the 2019 or 2020 model year will mean dealers are willing to haggle. There are some strong competitors in the midsize pickup truck segment, including GM's own Chevrolet Colorado. The GMC Canyon stands up well to most of the competitors, but with new offerings coming from Ford and others, it may be a tough sell going forward. The Canyon's chief competition comes from the Toyota Tacoma and Nissan Frontier, both of which are sales leaders in the midsize category. The unexpectedly good Honda Ridgeline is another option that may not be cross-shopped often, but should be. Potential GMC buyers would be remiss in ignoring the Chevrolet Colorado cousin, which offers everything the Canyon has without the price tag or upscale interior points. 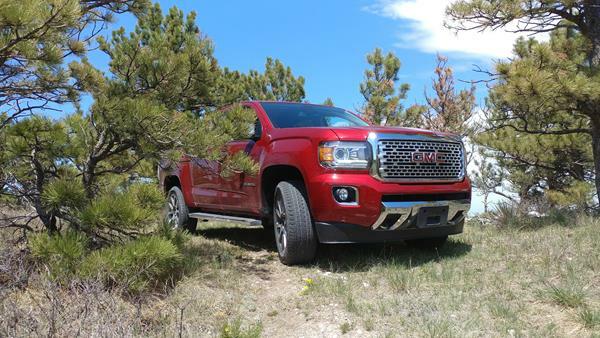 In the end, the 2018 GMC Canyon is the only real premium option in the midsize truck segment and it stands alone for that. We like the Canyon's engine choices and excellent design, and recommend it as a short-list option for midsize truck shoppers. Interested to see how the 2018 GMC Canyon ranks against similar cars in terms of key attributes? 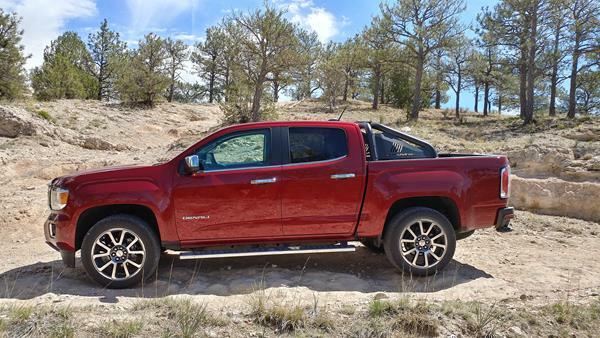 Here are the 2018 GMC Canyon rankings for MPG, horsepower, torque, leg room, head room, shoulder room, hip room and so forth.